~ Be entertained. Be horrified. Be inspired. Winter can seem like a deep darkness without an exit. The season brings depression to people who are most sensitive to daylight, with seasonal affective disorder. One long winter many years ago I spent 10 weeks in bed, unable to go to school or work and it was this time of year, just before spring appears all around – I forgot it was coming. Is it the lack of light or of color? 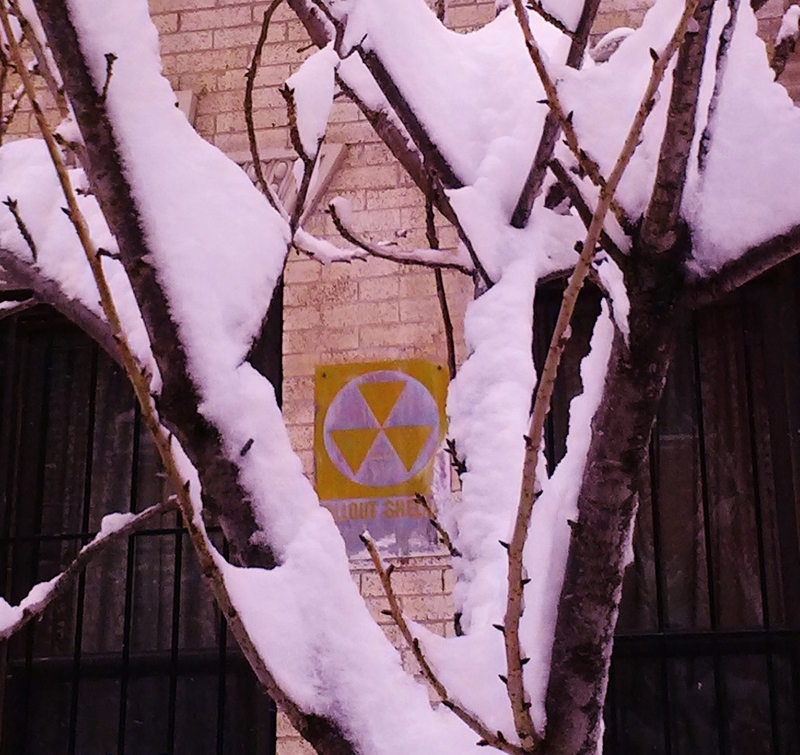 Taking this photo of a snowy tree in New York City this February, I caught the yellow nuclear fallout shelter sign behind it. And today in the news were 6 leaking radiation waste tanks on the west coast of the US, that engineers are struggling to clean up, government workers are quick to say are still safe. Oddly, the photo reminds me not of the depth of winter, or the danger of radiation, but of the hopefulness of people who think to build a shelter. Surely these were not the same ones who were creating the bombs we would shelter from or the waste we buried, I think. Color, color is my invincible summer. Yellow reminds me of light and of spring to come, of new leaves and flower buds. In the urban garden behind my house, though it is February, today I saw the big tree beyond the fence has pale yellow-gray knobs forming. These will become leaves. Tiny red and green pyramids only a few millimeters across are emerging now as leaf buds, the first sign of life in a rose-bush surviving its first winter in my backyard garden. With a little color, I can find an invincible summer inside me too. What is your “invincible summer”? Please add your comments to share views with readers. I look forward to hearing from you. “Just remember in the winter far beneath the biiter snow lies the seed that with the sun’s love in the spring becomes a rose” – The Rose sung by Bette Midler and a few others. Thanks for feedback Ryan – for friends in Australia and SA it’s summer – what helps you be inspired in the darker months? Where there’s no hope around, it must found within. I recall someone telling the story of his mother who’d survived the holocaust. He remarked that she was the most hopeful, most optimistic person he’s ever known, and she always found the good in everything. I think of those courageously battling incurabele illnesses, and I’m inspired. I’m roused at those who’ve fought to overcome adversity, injustice, oppression. How can I give up when others have persevered through the most dire circumstances? Yes, Michael this is great to remember. V Frankl’s writing I read recently shows his survival from imprisonment at the German camps, and how he came out with a hopeful, positive new world view for psychology. Nothing like darkness to bring a love for the light. Don't miss a column. Enter your email address to follow this blog and receive notifications of new posts by email. © Jennifer J Brown and J.J.Brown Author. Unauthorized use and/or duplication of this material without express and written permission from this blog’s author and/or owner is strictly prohibited. Excerpts and links may be used, provided that full and clear credit is given to J.J.Brown and J.J.Brown Author with appropriate and specific direction to the original content.